Obituary - Sallene Phyllis Reich - Bentz Funeral Service, Inc. Donations may be made to your favorite charity in Sal’s memory. 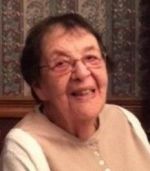 Sallene Phyllis (Sumberg) Reich, 89, passed away after a brief illness, with her family by her side, on Thursday, March 14, 2019. A lifelong Utica resident, she was being cared for at Sycamore House of Sitrin Skilled Nursing in New Hartford at the time of her death. Born on March 1, 1930, Sallene (Sal) was the daughter of Jacob Sumberg and Tessie (Liberman) Sumberg. She attended Utica schools and was a graduate of Utica Free Academy (U.F.A.). On October 29, 1950, Sal married Jerome Reich in Utica. Jerome passed away June 12, 1994. Her working years included positions with the former Abelove Laundry and Reich Supply Company in Utica. Sal enjoyed playing Mahjong, a tile-based strategy game, with friends in her younger years. Sal's oven roasted chicken, beef brisket, matzo ball soup and honey cake were feasts for the eyes and stomach….second to none! Sal was a past member of the Rebekah Lodge and North Utica Senior Center, and a current member of Temple Emanu-El in Utica. Survivors include her son, Neil (Bella) Reich, New Hartford; son, Terry (Deborah) Reich, Utica; and daughter, Dr. Ellen Reich (Dr. Alan Cortez), Tustin, CA; grandchildren, Jared (Denise) Reich, Utica, and their twin girls – Sal's great-granddaughters, Everly and Claire; Michael, Kimberly and Kaitlin Reich, Utica, and Jamie Cortez, Allston, MA, Jonah Cortez, Seattle, WA and Shira Cortez, Chicago, IL. Also surviving, sister, Miriam (Sumberg) Diemont (Jim), West Palm Beach, FL; brother, David (Lois) Sumberg, Rochester; a very much loved special cousin, Natalie Remsen, Sacramento, CA; several nieces and nephews; and close friends, Flora Moss and Irene Murawski. Visitation is at Temple Emanu-El, 2710 Genesee Street, Utica, noon – 1:00 p.m. on Monday, March 18, 2019, followed by a 1:00 p.m. service, with Rabbi Peter Schaktman officiating. Graveside services and burial immediately afterwards at the Odd Fellows Jonathan Lodge Cemetery, Whitesboro. After graveside services, please join the family for a traditional meal of condolence at the temple. Shiva will be observed, that evening, starting at 6:30 p.m. at the home of Terry and Deborah Reich, 536 Tamarack Street, Utica. Thank you to the doctors and staff of Sitrin Health Care and the Sycamore House for their care and concern for Sal's well-being. A special thank-you to Anthony Zizzi of Syracuse, for his heartfelt assistance. Arrangements are with the Bentz Funeral Service, Inc., New Hartford. Please omit floral offerings. Donations may be made to your favorite charity in Sal's memory. Terry, Neil, Ellen, and families We were so sorry to hear of your mother’s passing. Her friendship was very dear to my mother. She and your dad were among my parents closest friends! I hear the roll of the dice and the clicking of tiles. I’m sure our mothers have found each other and are playing mah jong up in Heaven! We are so sorry for the loss of Sallene. You are all in our prayers at this most difficult time. Our condolences.Please know that our thoughts and prayers are with you and your family.